Anyone with rudimentary knowledge of computing understands that heat, and more specifically, the transfer of heat is at the core of a well-functioning machine. Too much heat and there is a risk of damage and malfunction. Opening a computer is basically an insight into the most advanced ways to dissipate heat. It is a subtle balancing act between power and potentially dangerous heat levels. The idea is to maximize computing power without damaging the physical hardware. One of the solutions used to help cool the processor, one of the most power hungry components, is thermal paste. Amateur builders and professionals alike are well aware of the inherent benefits of using thermal paste. Though the paste represents a small cost in the grand scheme of an entire computer, it plays a crucial part in managing heat. After scouring the market and testing different products, our guide reveals the very best thermal paste available. We also delve a little deeper into the use and different types of thermal paste. What Is Thermal Paste and What Is It For? To understand what thermal paste is we must first look at how a processor is cooled. Note that paste is also used for other components such a GPUs. A processor sits on a motherboard and above it is a heatsink. This is a metal device that sits on top of the processor and works to dissipate the heat. It allows the heat produced by the processor to be transferred away through the heatsink and then into the general atmosphere. Varieties of cooler depend on the processor model so come in different shapes and sizes. As processing speeds have increased so has the need for increased heat control. In conjunction with this growth in size, heatsinks are larger than before. When two uniformly flat metal surfaces come into contact with one another, the junction is not perfect. There remain a number of minuscule imperfections that create gaps in the points of contact. Air then finds its way into these gaps and creates a kind of barrier that limits the heatsinks ability to soak up heat emanating from the processor. Air is known as an extremely weak conductor of heat and acts counter-intuitive to the desired process. Its insulating properties make it more challenging for heat to transfer from the processor to the heatsink. Ultimately, if left unattended this can result in overheating and potential damage. The gaps can only be seen at microscope level and are a natural byproduct of our limited ability to manufacture flawless metal surface. Though they are small in size, the number of gaps and the degree of heat in question makes them rather impactful. Thermal paste is able to seal these gaps and significantly better heatsinks’ innate function of removing heat. The paste creates a film that pours in the gaps and fills them in. With the paste applied, heat is able to travel unhindered to the heatsink thanks to the much better heat conductibility of the paste. Technically speaking, thermal paste is known as a thermal interface material and its conductibility can be measured as one hundred times better than air. You now see why thermal paste is such a crucial element of any computer. There is, however, one caveat to thermal paste; too much paste can result in the opposite and create reduced heat transfer. Applying the correct amount and with the correct method is of primary importance. Thermal paste’s basic composition includes silicon to bind the parts together and zinc oxide, as well as a host other substances and materials to ostensibly augment heat transferring capabilities. The general mix of silicon and zinc oxide is by far the most popular, in part due to its low cost and relatively good heat transfer performance. Silicon is also prized for the fact that it is completely non-capacitive meaning it doesn’t conduct electricity at all. They perform worse than metal pastes, but only in the order of a few degrees heat difference. The discrepancy is marginal unless the computer in question is used for extremely stringent computations. The application process is in theory a lot simpler than metal paste, but in reality in has an uncanny habit of spreading and liquefying. This process means it often dribbles away when the heatsink and component are pushed together. In response, manufacturers either move away from using silicon or use it in conjunction with metals to limit the process highlighted above. Paste made primarily of metals tend to perform best because metal is a wonderful heat conductor. Small pieces of metal are mixed into the paste. Metal pastes are known as liquid metals and often include materials like graphite, aluminum and silver. The only real downside is that metal is also a great conductor of electricity, or put differently, capacitive. The issue with this is that spillage can cause other electrical components to malfunction, short-circuit, and even fry. Metal-based paste are, therefore, the hardest to apply due to the need to be meticulous as well as cautious during application. Finally, there are other types of paste that are carbon based, ceramic based and diamond based for example. There is a choice to be made between capacitive, liquidity and viscosity. Computing power, expertise and cost all come into guiding this choice. A good rule of thumb is that silicon is cheaper and easier to apply. Metal is more expensive and far more suited if better performance is your prime concern. Metal is also the way to go if you want tangible results in comparison to the paste that was shipped as standard with your build or CPU/GPU. Much like food at your local supermarket, thermal paste has an expiry date, beyond which its utility is greatly reduced making it fundamentally obsolete. Paste degrades over time and loses its viscosity and heat conducting properties. In general, manufacturers recommend fresh paste be used within a couple of years of production, though this can sometimes be difficult to ascertain given the lack of clear manufacturing details that appear on packages. We recommend buying it from a knowledgeable vendor who can let you know when the shipment was received and, therefore, estimate its age. Buy the newest batch possible as a safety measure. In addition, don’t buy thermal paste and leave it stewing in a draw for years before using it. Only buy if you are certain to apply it in the immediate future to avoid a host of issues down the line. Note as well that silicon tends to deteriorate faster than metal based pastes. This is another benefit that dampens the capacitive limitations of metal paste. When applying thermal paste, the key is to find a healthy balance of thickness that allows heat to transfer, but doesn’t act as an insulator. Depending on the type of paste used, the application method can vary from using a brush to applying a drop on the surface of the processor and letting the weight, as well as the latching mechanism of the heatsink spread it out naturally. Follow the manufacturer’s recommendations and don’t rush the process. We always go by the mantra that less is far more advisable than more. We don’t want to put off non-professional applications, but merely advise caution and a little bit of preparation beforehand. Think a thin layer and plenty of pressure between the surfaces for maximum results. A quick look at the thermal pastes available can be a confusing endeavor. The multitude of names is quite dumbfounding, particularly as competing manufacturers are eager to assign more and more esoteric names to their products to get a market edge. Don’t be fooled or confused by the many names. Regardless of whether they are called, thermal grease, paste or compound, they are all essentially one and the same; thermal paste. As for thermal pads, these are different and merit the difference in title. Pads are cut to size sheets of silicone or wax with heat conduction properties. They are easier to install and less messy than paste, though they perform markedly worse than paste the higher the temperature. Our budget pick is the Arctic MX-4 thermal paste. It is a very popular option that proves more than adequate for a long list of applications and performs systemically well under most conditions. Designed for both CPU and GPU, Arctic MX-4 is made up of carbon particles and is non-capacitive, non-corrosive, non-curing and non-bleeding. This means contact with electrical components or pins on the motherboard won’t cause issues. The carbon element is also a welcome addition, given its natural conductive properties resulting in good heat transfer capabilities. Added to this is also an extended durability, which the manufacturer marks as up to 8-years. Setup is a lot simpler thanks to these features as well as the syringe casing for easy extraction. A small amount goes a long way making it a cost-effective option, notably if you have multiple machines to fix or build. We recommend it for beginners who may be worried about getting it wrong. To top it off, Arctic MX-4 is aluminum heatsink compatible as well. Once applied, performance is stable and reduces the heat of the processor or GPU significantly, with initial drops of 5 to 10 degrees. After a burn in period the results were even better. 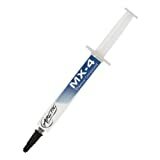 MX-4 is available in both 4 g and 20 g syringes as well. We also liked that their packaging is 100% recyclable. Another very low priced alternative is the similarly named Arctic Silver 5 Thermal Paste. Though they carry the same arctic component in their respective names, they are made by different companies. Arctic Silver 5 consists of 99.9% silver manufactured into three particle designs to ensure the whole surface of the paste produces efficient heat conductivity throughout. In addition, there are traces of zinc oxide, boron nitride and aluminum oxide particles to ensure a longer shelf life and further increase the density of the paste. The absence of silicon also helps this. It is non-capacitive and non-bleeding as well. 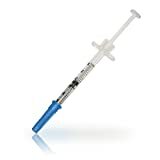 Installation is straightforward thanks to a good spring loaded syringe design and triple-phase viscosity which ensures it spreads smoothly and uniformly when applied. Arctic Silver 5 has a nice balance between liquidity and thickness, which we appreciated during installation. There is a burn in period of between 50 and 200 hours, during which the paste becomes more solid and entrenches itself in the microscopic gaps between the metal surfaces. Performance gains are measured in temperature drops of about 10 degrees out of the box, and tend to increase slightly after the burn in period. The biggest difference we noticed was when we replaced the paste provided with a large manufacturer build. The difference was in the range of 20 degrees. The price is also very low and you really do get a good cost-effective product. We chose the Coollaboratory Liquid Ultra Thermal Compound Grease as our liquid metal paste of choice because it systematically outperformed all other pastes. Not only has the Liquid Ultra won multiple awards, it is also widely regarded as one of the best pastes on the market. Made with metal through and through, it retains a true paste texture that makes application straightforward. Of course, this means it is capacitive and setup must be done with caution in mind. Fortunately, Coollaboratory provide in depth instructions on the best application procedure with a brush. The syringe packaging works well with a steady flow for installation. When tested, Liquid Ultra showed temperature drops that the other paste simply couldn’t match even though within the higher echelons the differences were minimal. Most will notice an immediate drop of at least 10 degrees, if not more, and after burn in temperature reduction can easily reach up to 30 degrees. All in all, one of our favorite picks and definitely worth the price. Another great paste from Coollaboratory is the slightly cheaper Coollaboratory Liquid Pro Thermal Compound Paste. It too has won loads of awards and was one of the first full metal pastes introduced to the market. Before the Ultra was released, it was the paste of choice for PC builders the world over and still remains very popular for the guaranteed performance it provides, hence our choice in this category. Consisting of liquid metal alloy, it is non toxic and has an easily applicable liquidity, but not to the point of bleeding or being unwieldy. It is entirely manageable, which is part of its allure. Liquid Pro doesn’t include any oxides or silicone, nor any particles. The result is a uniform heat conducting layer that works a treat to dissipate heat. We also like the fact that the package includes a thorough manual, cotton buds for application and a useful cleaning set of tissues and a metal grinding pad. We found that a little Pro provides the best results with average temperature drops of up to an incredible 40 degrees for standard power usage. Overall, we can’t fault the Liquid Pro other than the electricity conducting properties, but cautious installation bypasses this concern entirely as the performance results start coming in. 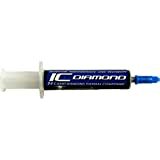 Innovation Cooling Diamond 24 Carat Thermal Compound uses diamonds to dissipate heat away from CPU and GPU. The 24 carats of micronized and purified synthetic diamond particles offer excellent heat conductivity in a dense and uniform pattern. Diamond is known as a great conductor hence its appearance in this paste. 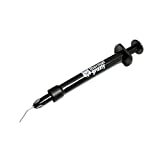 This ensures stability and a non-capacitive paste with lower viscosity for easier application and no bleed. The use of diamonds also ensure it lasts longer than silicon alternatives. Performance wise, IC Diamond 24 was near the top of the results chart and showed systematic temperature drops of around 10 degrees if not more. For something different to metal and silicon, we can’t fault this paste. Another diamond-based paste worth a try is the Cooler Master MasterGel Maker Nano. Made in a similar ilk to the Diamond 24 Carat above, it uses nano diamond particles to withstand heats up to 150 degrees. Its excellent viscosity means easy application without any undue imperfections for flawless heat transfer. As above, diamond ensures unmatched heat conductivity. MasterGel can be used for the more common CPU and GPU applications, but also for chip sets furthering its versatility even more. It is non-curing and non-capacitive for good measure, and lasts a considerable amount of time before requiring replacement. The diamonds are also better equipped to ward off erosion and oxidation for a longer life. A small drop will lower temperature considerably with some users reporting drastic drops in the range of 20 degrees for standard use. The price is also very attractive so MasterGel gets a much deserved thumbs up from us. The best aluminum-based thermal paste in our eyes is the Prolimatech PK-3 Nano Aluminium Thermal Compound. Containing between 70% and 88% aluminum particles, Pk-3 ensures a stable and well-rounded film that transfers heat remarkably well. It is non-corrosive and non-capacitive unlike other metals and works immediately without a burn in period. Pk-3 also lasts significantly longer than other metal pastes with no dry-out so reapplication isn’t required for a decent amount of time. The performance was nothing short of spectacular from the start. Installation is easy thanks to the syringe casing and spreading applicator. We found heat dissipation worked in the order of CPU temperature no higher than 50 degrees when working at full capacity. The only fault is the small amount of paste on offer. 1.5g is just about enough to cover one CPU or GPU, but not much else. This is easily remedied by buying multiple units. Considering an equilibrium between cost and performance, we landed on the Thermal Grizzly Kryonaut Thermal Paste. Another award winning paste, Kryonaut can withstand temperatures of up to 350 degrees making it one of the most robust pastes on the market today. Grizzly are a company dedicated to cooling solutions and their focus on perfecting their craft is apparent in how good Kryonaut is for the price. It consists of nano-aluminum and zinc oxide, is non-curing, non capacitive and works with aluminum heatsinks. This versatility is backed up with durability and phenomenal heat transfer capabilities. Setup is easy thanks to the included dispenser and ships in both 5.55 g and 11.1 g syringes for all project sizes. In terms of performance, it wasn’t far-off some of the more expensive and full liquid metal pastes, outlining its overall value and reliability. We found it works best on GPUs and notably for overclocking with temperatures hovering in the mid 40 degrees range when really pushed. Not only is it from a reputable manufacturer, it works well. For those that want value, this is the thermal paste of choice. Another offering from the experts at Thermal Grizzly is the Thermal Grizzly Conductonaut Thermal Paste. This a paste for the experienced and professional user who needs an efficient and performance oriented paste that they can rely on. Conductonaut, as the name suggests, is designed for heat conductivity. Centered around eutectic alloy, it includes a mix of metals including indium, gallium and tin to create a paste that is designed for efficiency and provides top of the range heat dissipation. 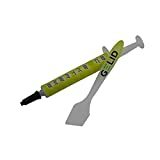 The low viscosity makes it ideal for quick application and we found that though the syringe contains a small amount of paste, it was more than enough to cover a component quite generously. We noted temperature drops of up to 25 degrees on certain machines making it one of the best pastes in terms of performance. We were also swayed by the fact that it is the paste of choice for many professional builders. Thermal paste plays an even more important role when a CPU or GPU is overclocked to exceed the factory standard performance levels. When a machine is pushed to the extreme, heat levels invariably rise considerably and managing them is of utmost importance. For this particular use, we opted for Ge Lid GC-Extreme Thermal Compound. GC-extreme is everything you need for overclocking. Non-corrosive, non-curing, non-toxic and non-capacitive. It can handle temperatures of up to 180 degrees so more than enough for even the most adventurous overclockers out there. Ge Lid are rather secretive about what makes up the paste, though this is of little importance given the performance gains when used. We found average temperature drops of at least 10 degrees when a machine is idle, and up to 25 degrees at full load. Some have even reported higher decreases. It shines when a component is overclocked and many users have been able to push their machines to an unexpected level while retaining safe temperatures with ease. Gaming machines were particularly responsive to the paste and benefited greatly from the overclocked speeds.